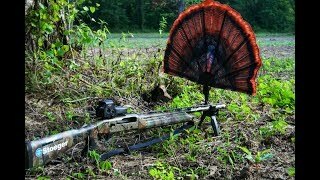 ALL NEW TAKE ON TURKEY HUNTING: Allows for the most exciting Turkey hunting experience! REALISTIC DESIGN: Redesigned fan hub that accommodates artificial and real fans. MOJO revolutionized turkey hunting in the last few years with the introduction of the MOJO Scoot & Shoot style of turkey hunting by use of the Tail Chaser and Scoot & Shoot Decoys, both developed to facilitate the most aggressive and exciting style of turkey hunting where they come to you (aggressively) instead of you going to them, often called fanning. The Tail Chaser was a convenient method whereby the turkey fan (decoy) was attached to the shotgun barrel. The new Tail Chaser Max contains the basic original barrel clamp and support legs which allows the hunter to set the shotgun on the ground while it remains erect and to remain hidden behind it without holding the gun. Improvements in the Max version include an oversize fan to better hide the hunter with a gobbler head for added realism, comes with a redesigned hub to allow both the artificial fan furnished with the decoy along with a special hub that allows use of a real fan. Scoot and Shoot style of turkey hunting is not only the most exciting but adds a dimension to turkey hunting as it works best after the first few hours of daylight, after the gobblers are henned up, or grouped up in open spaces. So when calling is falling off later in the day, look for gobblers in the open and Scoot and Shoot them with the Tail Chaser Max. Once you experience how turkeys behave when your face is behind a turkey fan, it becomes easy to see why you should never hunt without this fan on your gun barrel even when calling. Just killed a tom with this. I stalked him across an open field for about 200 yards, and when I got to within about 80 yards, he walked right to me. He still thought I was a turkey when I shot him at 30 yards. Awesome hunt! The tail chaser is so light and portable, you can put it in your vest and hardly know it's there. Can't wait to use it again! Just bought this recently. Used it for the first time this past Friday in Ohio and killed a 21.6lb turkey! I love how it folds up. I keep it in my vest so when the opportunity at a big Tom in the field came up I took it out and stalked up on him. He didn't like it and started walking to me which was a fatal mistake! I have seen a lot of different types of fans but this is so convenient to carry and set up. Can't wait to use it again! Way to go! Congrats on your turkey! Thank you so much for taking the time to leave this great feedback! We work hard to offer the most innovative and quality decoys out there. We hope that you’ll check out our other products as well! Great product! Highly recommend using it on private land ONLY! Attaches to the gun VERY EASY! The oversized fan is durable. My 13 year old son used ours on a turkey that had been “hened up” for a week or so! He went to work on him in the drizzling rain and in less than 45 min, the 19lb, 1” spur, 11” beard Eastern was down at 31 steps! Mojo, thanks again for making great products to make special moments like this with family and especially with your 13 year old son!!!! That's what it's all about! Tell your son we said congrats and thank you so much for taking the time to leave this great feedback! We work hard to offer the most innovative and quality decoys out there. We hope that you’ll check out our other products as well!